13:55 - How has the DPC has helped Dota 2 as an esport? 18:30 - Could Liquid be the first back-to-back champions? 36:45 - Are compendiums/battle passes a good thing for the scene? 43:22 - Is the prize pool stagnating? 57:10 - What would be your dream grand finals at TI8? 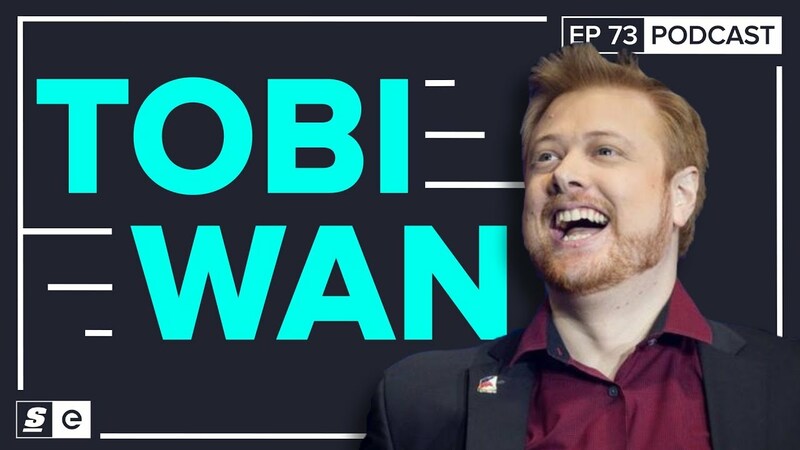 Toby "TobiWan" Dawson is one of the most recognizable personalities in Dota 2 esports. He's been the voice behind some of the game's most exciting moments and now he's poised to add more legendary soundbites to his resume at The International 2018. TobiWan joined theScore esports Podcast to discuss prize money distrubition in the Dota Pro Circuit system, the prestige of TI and his ideal grand finals this year at TI8. For any professional team, fan or member of the media, The International is the pinnacle of the calendar year for Dota 2. As TobiWan puts it, "it has the biggest prize pool, it has the biggest collection of teams from around the world and it's the largest prestige." With the massive, ever-growing prize pool that comes with TI, teams often build their entire competitive season around this one monumental event. But TobiWan told theScore esports you don't necessarily need to be a TI finalist to pay your rent. "There is still a lot of money that comes through the DPC itself throughout the year," he told theScore esports. "This year was fantastic for all the teams." TobiWan added that, "Next year, if Valve do it right... they said they're going to give DPC points for every team that attends a Minor and a Major to avoid the absolute debacle that was the DPC points at the end of this season. If they do the same type of thing with prize money there's a lot of money that can actually go into the teams and the teams won't fall apart." In fact, he said the Minors are actually one of the best places to look for prize money. "No team that attends a Major can attend a Minor," TobiWan pointed out, "unless you win the Minor and attend the Major, back-to-back." This system, he said, "ensures that the money is being spread out. It ensures that there is a maximum amount of teams that get DPC points every single block of minor/major." Last year's TI7 saw Team Liquid come out on top, winning the final in a convincing 3-0 fashion against a strong Newbee squad. No team has ever won back-to-back world championships and TobiWan said he doesn't think that it will happen this year either. Team Liquid are one of the favourites for the event, but history points towards a Chinese victor this year. "It's tradition. It's tradition that a Chinese team wins on every even year. In every odd year it's a western team that wins," he said. "A lot of people are asking who the strongest is out of China right now and it's definitely LGD but we don't know what meta is going to be played." TobiWan admitted Liquid are a strong team but said the odds are not in their favour. "They're fighting two different things. There has been no back-to-back winners, there has been no dual winners of TI, and they aren't a Chinese team." Since TI3, Dota 2 has used compendiums and now battle passes to grow the prize pools for The International. Twenty-five percent of proceeds from all compendium purchases have gone directly to TI prize pools. "It's one of the primary reasons that Dota is what it is today. Crowdfunding is how a lot of the brands were birthed in Dota. I think Beyond the Summit is one of the greatest examples of this," said TobiWan. Some members of the Dota 2 community have voiced their concerns over the years regarding the amount of money Valve retains in Compendium and Battle Pass fundraising. "It's that feeling of animosity towards it," explained TobiWan. "You raised $25 million in prize pool, that means Valve just made themselves $75 million in one tournament and that's not including the merchandise they'll sell, the tickets they'll sell, any kind of other sponsorship they potentially could have sold but they normally don't sell." When evaluating the cut that Valve takes of Compendium and Battle Pass sales, TobiWan cautioned not to underestimate the cost of producing an event on the scale of The International. "Running an event of TI's size is not cheap," he told theScore esports. "It really is not cheap and $25 million to run TI would potentially be a lower part of the budget. I wouldn't even be surprised if to run the entire thing they were spending near $40 million. It would not surprise me. Valve is still a company that wants to make money at the end of the day and keep the rest of the year funded." With the prize pool for TI8 currently sitting at about $24.7 million as of press time, it's looking very likely that this year's event will surpass the prize pool of TI7. If it does, however, it may not be by much. When asked if he thinks that TI's prize pool is stagnating, TobiWan said it won't be easy to continually break the previous year's record. "It would be hard to go above it and if it does go above it then Valve have done something very smart to get more money out of the community," he said. "Normally with micro-transactions you have the guys who buy the small stuff then you have the whales, the ones who buy everything. These are normally the ones who skyrocket everything." With Dota 2's monthly average player base down roughly 100,000 compared to this time last year, according to Steam Charts, the amount of cash flowing in through crowdfunding efforts could be ebbing. "How much money did those 100,000 people represent?" TobiWan said. "If we lose another 100,000 people going into next TI, what will that represent? There's always a peak around August. There was an increase of around 11 percent during last TI." With last year's event ending in a 3-0 sweep, most Dota 2 fans will be hoping for a more competitive grand final at TI8. As for TobiWan, he said he's hoping for a Virtus.pro against Team Liquid main event. "VP/Liquid would be the dream final at the moment but I will definitely change that opinion at the end of the group stage ... then you see the meta that develops inside it because some of these teams are really fantastic on specific metas and then the group stage can totally change everything around... some teams will flourish in this and other teams will struggle so I always find that fascinating about every single TI that comes up but for me," he said. "No matter what happens ... I like to think about the teams that perform really well and play the highest quality Dota and they will never give up until the end —Liquid/VP."